Hi there, top dogs. Monday surely has a better taste to it with Palmeiras in the lead, wouldn’t you agree? With three rounds left before the knockout phase, things are looking brighter by the day. 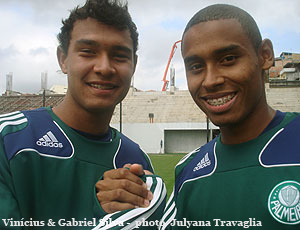 As foreseen, Palmeiras’ counter attacks became frequent. They were often stopped short by unjust measures, rending several yellow cards to Bragantino’s players. Kleber suffered a lot, as usual (thankfully also he kept his cool, avoiding a booking that would see him far from this coming Sunday’s derby against Santos), which rendered many a free kick in Palmeiras’ favour. It was one of these, well executed by Lincoln, that found Thiago Heleno in the penalty area; with his back towards the goal, the tall youngster deflected the ball masterfully into the left top corner. 2-0 and end of story: time was nearly up and Bragantino had nothing additional to throw into the fight. Instead, to finalise, João Vitor calmly put away the third, closing the scorecard. Watch the goals below. After Saturday’s game Scolari gave the squad a few days well deserved rest. With players back tomorrow (Tuesday) morning, they start preparing for the derby, training both morning and afternoon on the Tuesday and Wednesday, then only in the afternoon the remaining days leading up to the game. Both Danilo and Marcos Assunção will be back and at the coach’s disposition. Valdivia will be evaluated as the week progresses. Slowly, Scolari is moulding these men into a homogenous identity. The comradeship and solidarity is visible, idem the confidence. Importantly, Scolari is also opening up the door for Palmeiras’ young talents; so far, six players have been “promoted”: wingbacks Gabriel Silva, Luis Felipe and Andrade (all three of them are 19), defensive midfielder Bruno Turco (19 also) and strikers Vinícius (only 17) and Miguel (18). But it doesn’t have to stop here; more players could come, as recently pointed out by Scolari. Clearly, he sees it as an important part of his job to keep a close watch on the kids and give them the opportunity when possible. Good for now, even better for the future! E mais uma vitória do Verdão. Great win.Now hopefully we will hold on to 1st place and play at home in the next phase.Dalhe porco!